The nail polish that you choose should match your skin tone. The colour that may look good on one person may not look good on the other. So, if you try to copy the nail polish colour of your friend, it may look completely washed out or even look too bright on your hands. So, try to wear the right shade. This will help in showing off the colour the best way. If you have pale skin, you should wear pale nail paints. If your skin tone is medium, you can wear shades of medium darkness. Ladies having dark skin should wear very dark nail paints. This is one of the easiest methods to follow. But it is very restrictive as you will not choose contrasting colours when you follow these tips. You will not get vibrant looks either. Here are also a few different ways to get the perfect nail paint shade for your skin tone. 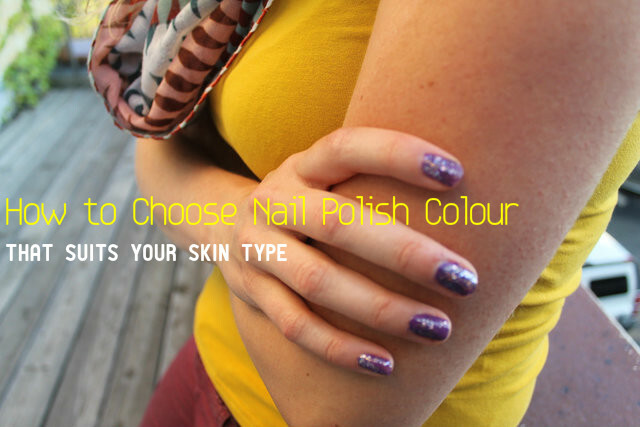 Here is how you can choose the right nail polish colours for different skin tones. If you have a fair skin, you can try wearing nail paints of various light shades. All kinds of pastel shades will look great on your nail. You can wear dark reds and ruby shades. Purple, plum and burgundy also match your skin tone. Silver, white and pale pinks are also good for your skin tone. You should try not to wear any shade that is too dark. Dark shades of black, green, orange, blue etc will not look good on your skin tone. However, you can wear reds. If you have a medium dark skin, try wearing deep shades on your nails. These will look good on your skin. Bright shades will look trendy, while dark shades make you look glamorous. Try to wear red, purples and bright orange shades. Rich and dark shades, except dark brown, will look good on your skin tone. Try not to apply nail polish that are of pastel shade or are too light. These can give a washed out look to your fingers. Try not to wear silver, white and neon coleus, as these colours can make your skin look dull and aged. It is important that your nail polish colour should complement your skin tone. But it is also important that you choose the colour according to the occasion and the outfit that you are wearing. Once you have chosen your nail polish, apply it well on your nails so that your fingers look fantastic. People with medium skin tone or tan skin tone can wear a large number of shades and look good. You can also try nail arts as they look best on this complexion. You can wear light pinks, blues, reds and purples. These shades will complement your skin tone perfectly. Silver and burgundy are also good for your skin tone. You can also try peach and pale brown shades. Try not to wear shades of gold and rust. Women with very fair skin often have pink undertones to their skin tone. You can try wearing colours that are in the pastel family. These shades will look amazing on your skin. Light pastel shades will give a classy and sophisticated look. Colours like very dark blue, navy blue and midnight blue shades will also look good on your fingers. You can try them if you want to wear very dark shades. You can also try dark reds and pinks. Shades of reds and purple will give you glamorous look. It is better you avoid wearing black coloured nail polish. You should try not to wear nail paint colours having too much of a pink undertone in them. Do not wear sheer or ‘invisible’ colours because they have similar undertones and will blend completely with your skin tone. First of all, you have to apply a clear base coat on your nails. Then you can apply the nail polish. After applying the nail polish, seal it with a top coating. This way it will last for a longer time. For your base coat you can apply a white nail polish. Once you have finished applying the base coat, put on the nail polish you have chosen. This will make the colour of your nail polish pop. Along with choosing the right nail pant, you should also remember to keep your nails clean. Trim your nails at regular intervals and take proper care of them. This will add to the beauty of your nails.